The Indigo Hanging Rail in cream is a stunning piece of practical furniture that sits comfortably in traditional and modern spaces. Use the Indigo Hanging Rail to showcase your favourite pieces of clothing, or simply to store your wardrobe neatly and keep the space free from clutter. The Indigo Hanging Rail in cream has a stunning frame work that results in an elegant rail that you'll be proud to display in your home. Create a warm and inviting space that is easy to keep organised thanks to the additional storage provided by the rail! The Indigo Hanging Rail in cream has stunning frame designs, resulting in an elegant piece for the home. The rail is ideal for use in the bedroom, in your walk-in wardrobe or changing room or in an open plan apartment or studio! The frame of the Indigo Hanging Rail in cream is strong and perfectly constructed to store away your clothing. It's a stand out piece of furniture that benefits any space. Don't let your clothing ruin the atmosphere in your home. Increase the amount of usable hanging space with the Indigo Hanging Rail in cream. The hanging rail can be used as an alternative to a wardrobe or alongside other pieces of furniture to increase the storage you have available. 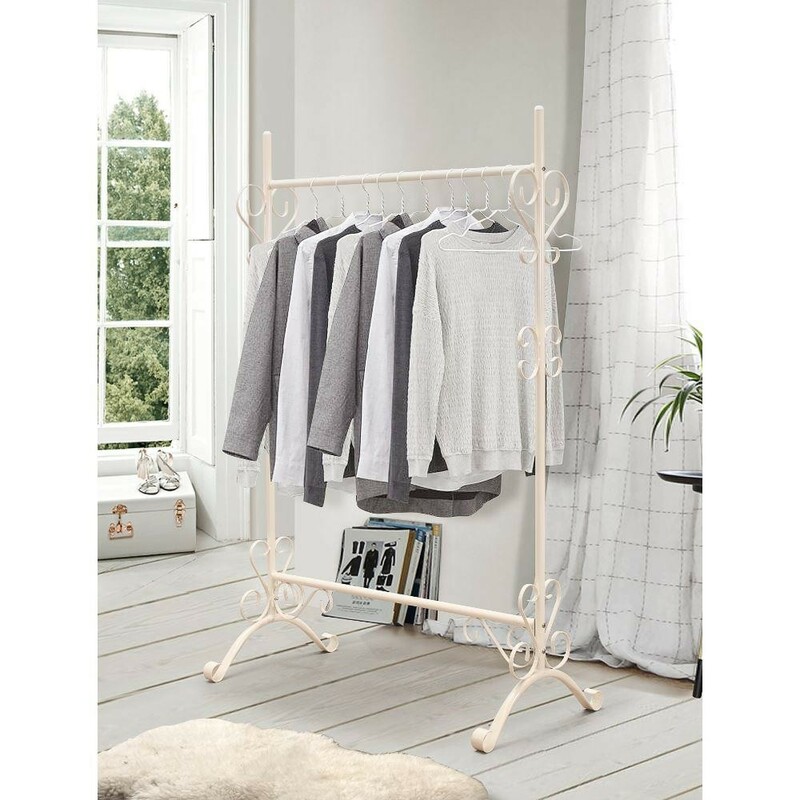 Use the Indigo Hanging Rail in cream to keep the room organised and tidy and to stop clothing from taking over the space. The Indigo Hanging Rail in cream is strong and reliable. Use the hanging rail to showcase your favourite pieces of clothing or to simply keep the clothing neat and tidy. The elaborate detailing of the Indigo Hanging Rail frame results in a pretty piece of furniture that can become an outstanding focal point in any room.